HP has been out of the smartphone market since iPhone and later on Samsung took over. For sometime now, we have been hearing HP device rumors here and there. Here is another leak of an HP smartphone, HP Brave, showing up on AnTuTu Benchmarks and it sure is impressive. 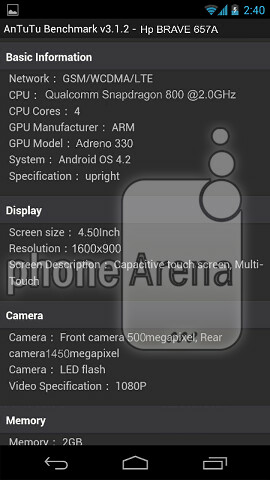 The benchmark screenshot was tipped off to PhoneArena by an Unknown Tipster (according to Phonearena). The specs are pretty good with the smartphone holding a 2 GHz. Snapdragon 800 Processor and along with a standard 2 GB RAM. Screen Size of 4.5 incha and a 1600x900 resolution is also standard for high end smartphones these days. The rear shooter is impressive at a 14.5 MP and a front shooter of 5 MP is rare spec. There is also Adreno 330 to handle the graphics.